Ogni O Jol is a collection of eleven short stories by young and established writers, and three papers by researchers. Story tellers always look for their raw materials in everyday happenings, in their surroundings. This has in fact been an age-old process. Here is a project conducted by Shamim Azad who gathered some researchers from Nigeria, England, Ghana, Egypt, Pakistan and Bangladesh to conduct a workshop named 'Pathways of Women Empowerment'. Twenty five authors took part in the six month long workshop. The findings were given to some writers in the form of video clippings and case studies. The writers then put their imagination at work and came up with some extraordinary stories about some very ordinary women of Bangladesh in this book. 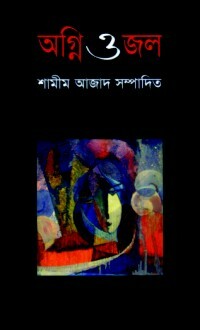 The book is comprised of two stories in English and all others in Bangla, and the group of writers covers both genders. Firdous Azim, well known Professor of English, shares her views about transforming research work into fiction. The association of young and old writers throws light on issues like writing mentorship, sharing experience with the literary icons like Selina Hossain and the new journey of non-fiction to fiction. All the eleven stories are about women. In one way or the other the writers depict their characters as liberated beings. As a reader one feels that in a society where women are almost always suffering with some kind of binding, these women characters really are the rays of light. The light that might one day cast away all the darkness governing the lives of the majority of Bangladeshi women. Starting from the young university student like Tania or the strong-willed Parul who leaves her family to earn her living in a foreign land or even Sumaiya who falls in virtual love with Fahad via the chat room. They all tell us stories of women we come across every day. Monowara, whose husband's absence makes her a prey to her guardian, the step brother, is also heartrending. When she gives birth to a child, she reveals to the shocked villagers that Kalu Mia, her step brother is in fact the father of her child whom she wounded one night with the kitchen knife in between his thighs. While writing 'From research to Stories' Dr Firdous Azim points out that not many women have made their place in history as they have in fiction. “The Pathways of Women's Empowerment research programme is engaged in capturing the ways in which women are placed in the changing social scenario” Professor Azim points out. She also adds the Government and the NGO have played a big role in changing the lives of Bangladeshi womem. The title Ogni O Jol may have arisen from the fact that women have the fury, indomitable spirit as well as the capability of accommodating the adversities that may be caused by her surroundings. Shamim Azad expresses her hope that similar books by other writers may be published in the other participating countries and that there might be a compilation of another book with writers from all the six countries.